Whilst on a family holiday in Wales, in July 2001 we took a day trip to Tremeirchion to visit the grand country house Brynbella that Hester and Gabriel Piozzi built, and also to see their final resting place at the village church. At the Church we met a lady who told us that a couple of weeks previously the BBC had been filming with Beryl Bainbridge about the Thrale family. Surprised and a little excited I spent the next few weeks searching the BBC’s web site every few days. After about a month I found a BBC news article reporting that Beryl Bainbridge’s new book According to Queeney was the bookmakers favourite to win the 2001 Booker Prize. I could not believe it. After a year researching the family history of my family - a family so obscure that the only other Thrale's I had ever met were aunts, uncles or cousins - we were to be on the television and be the subject of a book by a major author, and in for the Booker Prize to boot! It was hard to believe. That was how I discovered According to Queeney. A little more Internet searching, and I discovered a book signing on 12 September 2001 at the London bookshop Hatchards. I quickly booked leave from work, there was some surprise among my colleagues that a colleague would be absent from a staff meeting to attend a book signing in Mayfair! I was surprised too, I had never been to a book signing before. It was the 12 September 2001, the day after the terrible terrorist attack on the Pentagon and the World Trade Centre in New York. Several people bought the book to send to friends and relatives in America. Beryl kindly signed a book for me, I asked her to inscribe it “;To David Thrale in memory of Kenneth”; (my late father Ken Thrale). I imagined that she hadn't met a Thrale and that she would be surprised and make some comment. However, things didn't go at all how I thought. I could never of imagined that she would reply, “;How do you spell Thrale”;? I replied, “;As in Queeney Thrale”;. As I watched Beryl, I could see the penny drop! 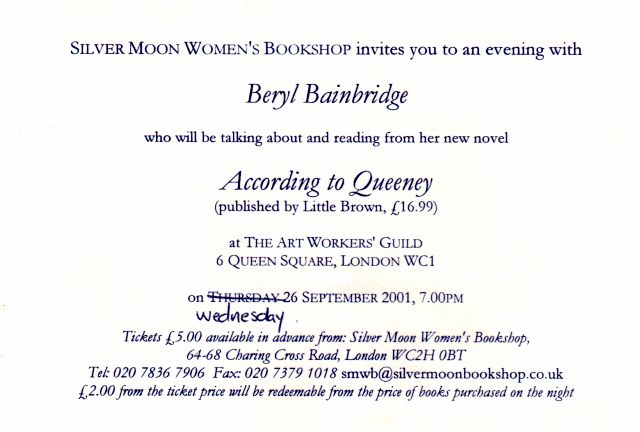 At the Silvermoon Women’s Book Club on 26 September 2001, Beryl talked about the book and answered a few questions. She described how when signing up for a three book contract she had committed to writing a book on the Titanic and on the Crimean War, and then on the spur of the moment - with no idea about what the third book would be about - she came up with a book about Samuel Johnson. She decided to found the subject matter very daunting and explained that it took awhile to get feeling for the age. Her research involved reading only contemporary documents. No recent books were read. The book starts when Johnson was aged 57. She found Hester Thrale to be extremely clever & vivacious. She explained that Johnson lived at Streatham Park for 17-18 years. In answer to the question of how much of the book was her imagination, Bainbridge explained the lengths that she goes to ensure accuracy and that all the characters were real people. In answer to my question about the Letters to Ms Hawkins, Beryl explained that whilst Miss Hawkins was a real life character, the letters were Bainbridge's creation. She went on to describe the size of Henry Thrale's coffin. It was an enjoyable - but wet- evening. Beryl Bainbridge came across as a down-to-earth and witty person. Enough rambling, on to the book. Well I must offer the caveat that this is my first book review and that thus far I have only read about two-thirds of the book. The book chronicles they years during which Johnson and the Thrales lived together as a family unit. The book is 'faction', i.e. a dramatised account of real historical people and the events that really happened to them. In my amateur research I have often thought that accounts I have read of the relationship didn't ring true. Some completely sideline Henry Thrale, when I always felt that Johnson had a deep respect for Henry Thrale and regarded him with great affection, and always deferred to him as the head of the family. I thought that Johnson valued being part of the Thrale family, and obtained from the family a sense of belonging, support during his bouts of illness and depression, care for his well being and tolerance of his anti-social ways. A bit like a mother treats a child, Henry and Hester would ensure that Johnson was cared for and made more respectable in appearance. There was of course an extraordinary connection and affection between Johnson and Hester Thrale, but I'm not convinced it was the great passion that others have speculated on. Throughout the book, I have been impressed with the accuracy and attention to detail. Little stories and accounts are accurately included, such as Baretti's views on tin pills, as well as the events of wider public interest, like the visit to the Court of French Queen Marie Antoinette. I have also been impressed and heartened that Beryl Bainbridge has portrayed the relationships in the way that I had imagined them, rather than the way that some other commentators have portrayed the relationships. Above all the book is a really good read that isn't too hard going. The story in the book isn't recounted in chronological order. I found that slightly distracting. Obviously I had the advantage of knowing who the people in the book were. This definitely made the book easier to follow and comprehend. Most readers will not have the benefit of this knowledge, perhaps a glossary of the characters may have been useful? In summary even if you have no prior interest in Johnson or the Thrale family, this book passes my acid test with flying colours, it is a good enjoyable read. If you do have an interest in the history - and you probably do if you are reading Thrale.com it is accurate and unlike all the other family history documents I have read, gives a real insight into the lives and personalities of our predecessors that is absent from the usual dry historical accounts of events and dates. A very big thank you to Beryl Bainbridge from all Thrale's everywhere - now go and buy it. The first chapter of According to Queeney can be read on-line. Shortly after the books publication, the BBC broadcast According to Beryl, a television documentary on Beryl Bainbridge and her book According to Queeney. First, what a great site Thrale.com is! Second, you might be interested to know that Beryl Bainbridge is talking to the Streatham Society about "Streatham and the Thrales" on the 17th February 2003. See the Streatham Society web site for details. Bainbridge's novel refers (in Chapter 3, "Sweeting") to a sitting by Hester for a portrait by Hogarth. Is this true, and, if so, where is the painting now? Great web site, by the way! It is said - by Hester in Thraliana - that aged 14 she was the lady in William Hogarth’s 1758-9 painting The Lady’s Last Stake, and was given by Hogarth a monkey’s paw mounted in a base of silver as a reward. I believe that the painting is now at the Albright-Knox Art Gallery, Buffalo, NY, USA. Many thanks for you kind comments about Thrale.com. I'm glad that you like it. Have you heard about the Beryl Bainbridge book, According to Queeney - were you consulted - and what do you think of it? I have added your book and have placed information on Thrale.com telling people about it, including a link to your web site. If you want to let me know where people can get it, I'll add that information (I bought my copy of your book from the vicar at St Leonard's Church, Sandridge). I am currently reading Beryl Bainbridge's book Beryl Bainbridge's book and I'm enjoying it. No, she didn't consult me in its production. However I have since met her at a book signing and also at 'An Evening with Beryl Bainbridge' organised by a Women's book club in London. 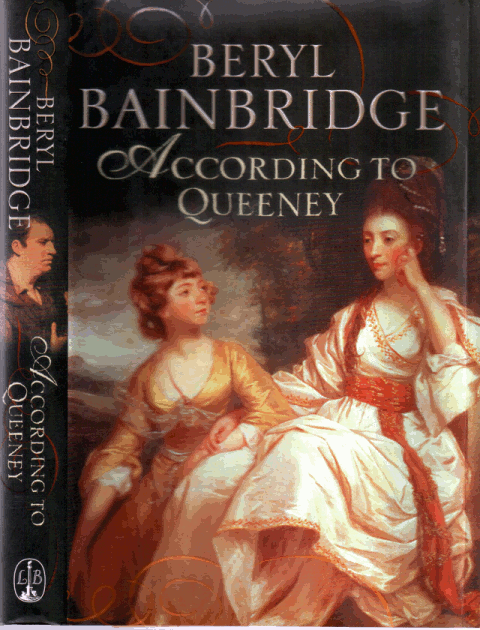 Did you see According to Beryl, the BBC television programme on Saturday about Bainbridge's book and the Thrale's? I have it on tape and hope to make this available at a future date through the web site to those who missed this. The BBC seem to have got hold of some material that I haven't come across before. Fortunately I know someone who works there and they have spoken to the researcher who seems amenable to giving me a little help. Just wanted to say what a super website. I have just read According to Queeney and your site was just what the doctor ordered. Well thought out and beautifully presented.